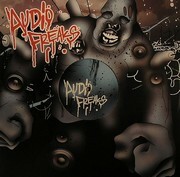 Audiofreakz offer up two weighty slices of dubstep fire as a first release for this brand new imprint. The A side sees Romanian producer TRG come with yet another dance floor destroyer to add to his already impressive repertoire of releases . With pounding ragga drum breaks, a bassline that would hospitalise anyone over 50 and rave leads to make you brock out something stupid, the name of this one says it all. On the flip Emalkay reworks the track into a pounding halfstep stomper that is sure to get ravers shouting for the pull-up. With drums tougher than ironmans pants, if you can’t dance to this then you clearly haven’t got legs. Post Rave Blues Part 1.